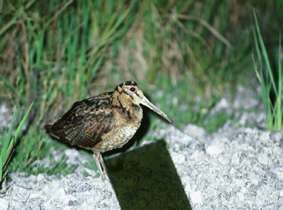 This woodcock has a small, declining population as a result of logging of forest and also predation. The combined effects of logging, introduced predators and accidental shooting are likely to lead to an increased rate of decline in the near future. The shape and color of the Amami woodcocks resemble those of the common woodcock, its relative. But its distinctive characteristics are a shorter head, longer legs, and a beak with a thicker base, which is also slightly curved at the tip. These factors qualify it as Vulnerable. Amami Woodcock Scolopax mira is known from Amami, Tokunoshima, Okinawa and the Tokashiki Islands in the Nansei Shoto, southern Japan, where it is found in broadleaf evergreen forest, being locally common on Amami, but less numerous on the other islands (Brazil 1991), and its total population is estimated at less than 10,000 individuals (Yanagisawa et al. 1993 in Rose and Scott 1994). It is threatened by deforestation in some parts of its range (e.g. Miyagi 1989), but predation by mongooses (introduced to Amami and Okinawa to control poisonous snakes) may prove to be a more serious threat, and already appears to have caused a population decline in part of Amami (N. Ichida in litt. 1994).